Instant Replay Review upheld 1B Umpire Dan Iassonga's out call in the bottom of the 7th inning of the Pirates-Brewers game. With one out and one on, Brewers batter Lyle Overbay hit a 0-0 sinker from Pirates pitcher Jared Hughes on the ground to Hughes, deflected to third baseman Pedro Alvarez, who threw to first baseman Ike Davis as Overbay arrived at first base. Upon Replay Review as the result of a challenge by Brewers Manager Ron Roenicke, Iassogna's ruling was affirmed, the call was correct. At the time of the review, the Brewers were leading, 4-1. The Brewers ultimately won the contest, 5-2. This is Dan Iassogna (58)'s second Replay Review of the 2014 MLB Regular Season. This is Crew Chief Dale Scott's 10th supervised Replay Review of the 2014 season. 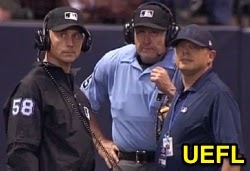 This is the 272nd Instant Replay Review of the 2014 MLB Regular Season. This is Brewers Manager Ron Roenicke's sixth Replay Review of 2014. Umpires are now 143/272 (.526 Affirmation Rate) in Replay Reviews during the 2014 MLB season.